Looking to explore the UAE on a budget? There are so many great UAE attractions to visit, and some of them are even free! From the Sheikh Zayed Grand Mosque in Abu Dhabi to the ‘ghost town’ in Ras Al Khaimah, here are 5 top UAE attractions that you can visit without spending a dirham. The Sheikh Zayed Grand Mosque is not only the largest, but one of the most stunning mosques in the country. From the grand architecture to the intricate details inside, everything has been designed to perfection. Definitely a must-visit! 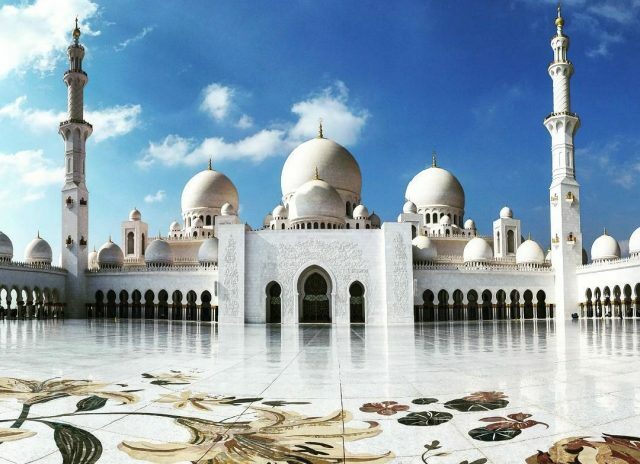 Did you know the Sheikh Zayed Grand Mosque is home to the world’s largest carpet?